These gluten free Cream Puffs have a crisp outer shell with a nice large hollow in the middle, perfect for your favorite filling. 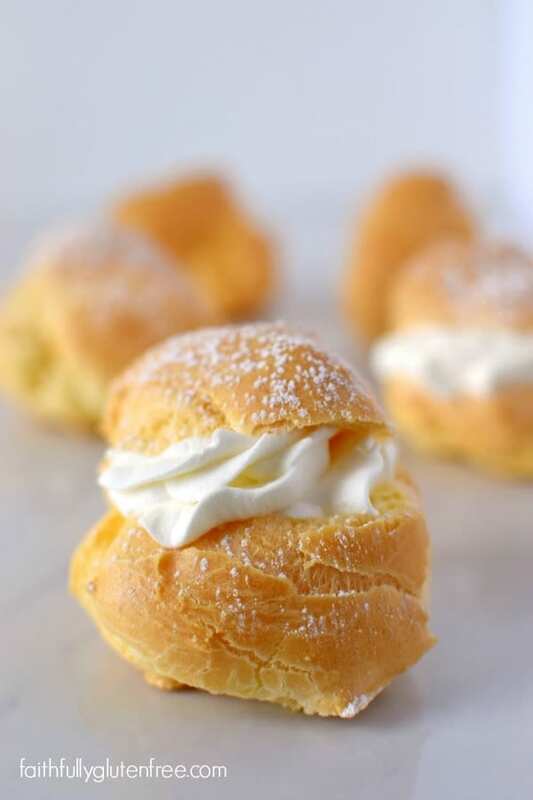 The cream puffs are perfect for both sweet or savoury fillings.Which will you choose? I will admit it now… Before having to eat gluten free, even though I was a baker, I never mastered making cream puffs. I always had trouble with them not rising properly, or with them staying soggy in the middle. My Grandma was really good at making them though, and if they were coming over for supper, she would whip up a batch filled either with pudding or whipped cream. This was always a treat, because my Mom never had success baking them either. That was all in the past though. Now, I think I make a pretty awesome gluten free Cream Puff. They are crisp with a beautiful hollow in the middle, perfect for your favorite sweet or savory filling. The trick, I believe, is in making the “Pâte à Choux”, which is the dough that can be used to make Cream Puffs, Éclairs, or Crullers. You have to be sure to fully incorporate the dry ingredients into the wet before adding the eggs, and once it comes to adding the eggs, they have to be added slowly, making sure that it is fully mixed in before adding the next. The easiest way to beat the eggs into the dough is with a stand mixer. A heavy duty hand mixer may work, but I’ve never tried it. A good old wooden spoon would work too, I’m sure, you just have to have good arm muscles. I can’t imagine my Grandma got out her stand mixer to bake up a batch, I’m sure she used her wooden spoon or hand mixer when making cream puffs. 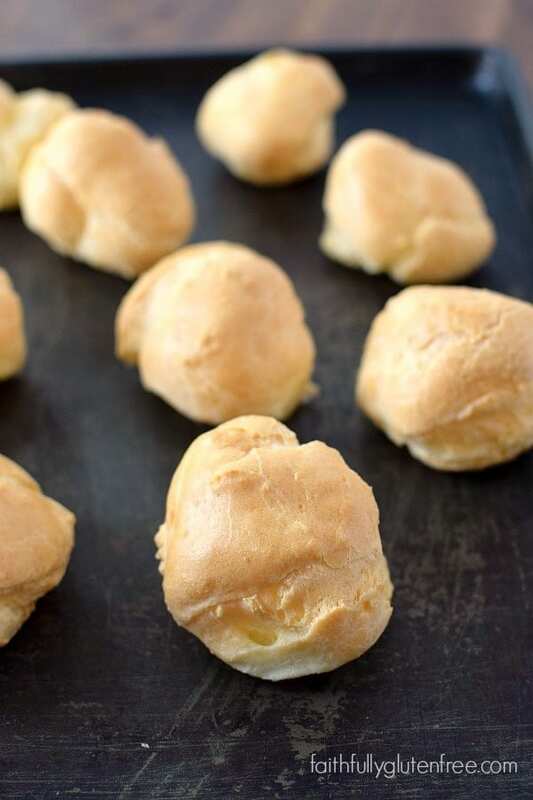 Since the dough itself has no sugar in it, you can use these gluten free Cream Puffs for either sweet or savory fillings. Whether you chose a rich, creamy pastry cream, or a spicy chicken salad, I don’t think you’ll be disappointed. 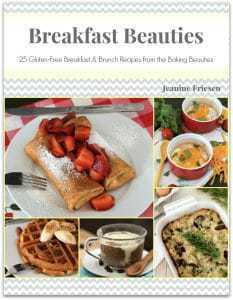 Looking for something besides whipped cream to fill your gluten free cream puffs with? How about some smooth Peanut Butter Pastry Cream, or Lemon Curd? These gluten free Cream Puffs have a crisp, outer shell, with a nice large hollow in the middle, perfect for your favorite filling. Preheat the oven to 400 degrees F (204 degrees C). Line a baking sheet with parchment paper, and set aside. In a mixing bowl, whisk together the white rice flour, sweet rice flour, xanthan gum, salt, and baking powder. Set aside. In a medium sauce pan over medium-high heat, bring the water and butter to a boil. Once they have reached a boil, pour all of the dry ingredients in at once, and stir with a wooden spoon until the dry ingredients are completely incorporated, and the mixture looks similar to play dough. Place hot dough into a large mixing bowl or bowl of a stand mixer fitted with a paddle attachment. Beat on medium-high speed for a minute or two to cool the dough down a bit. With the mixer on medium speed, add one egg at a time. Beat dough until the egg is completely incorporated before adding the next one. When you add an egg, the dough will look like it breaks apart, but keep mixing it until it comes back together again. Repeat until all 4 eggs have been added. Mix on medium-high speed for 1 minute, until the dough is smooth. I use a 2 tablespoon cookie scoop to place the dough onto prepared baking sheet, leaving about 2-inches between cream puffs. 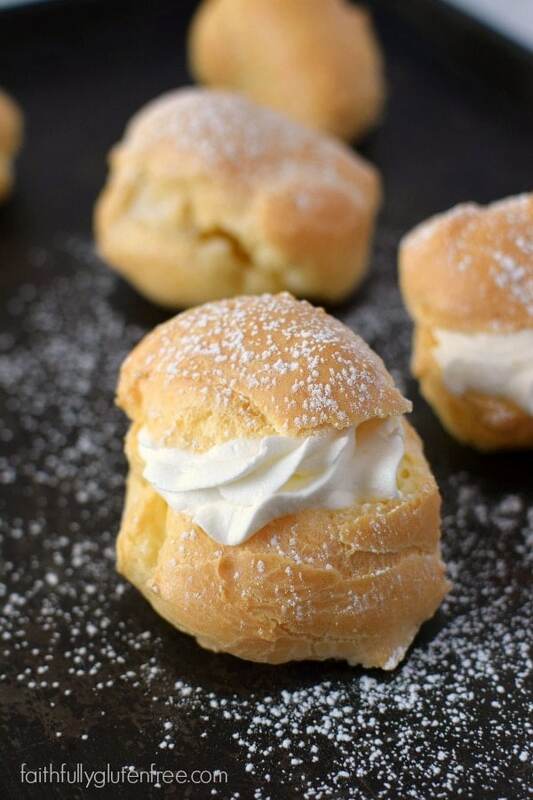 You can use your fingers, dipped in water, to help smooth the tops of the cream puffs before baking. Bake in preheated oven for 30 minutes. Turn off the oven, open the door, and pierce each cream puff with a sharp knife. This will help any steam trapped inside them to escape, giving a nice crisp cream puff. Leave the cream puffs in the oven, with the door open a few inches, until the oven has cooled completely. 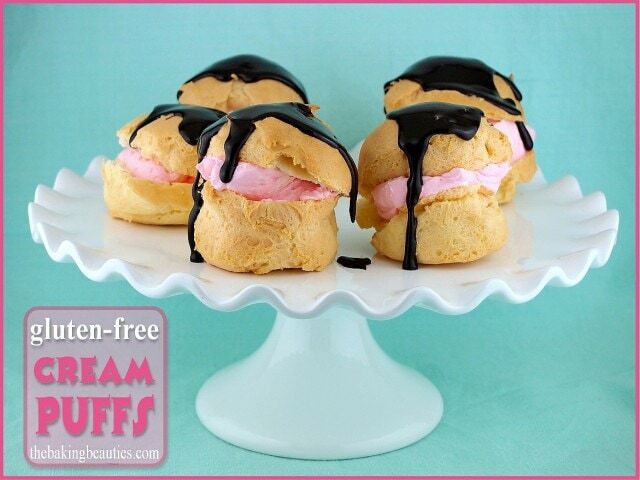 Once cream puffs have completely cooled, fill them with a sweet or savory filling. They are best served the same day, but can be stored in an air tight container. To crisp unfilled cream puffs again, place in a 400 degree F oven for 10 minutes. This dough, the Pâte à Choux, can be frozen to use later. Spoon the dough onto a wax paper lined baking sheet and place in the freezer. Once they are frozen, store in a zipper seal freezer bag. To bake, place frozen dough onto parchment lined baking pan, and let come to room temperature before baking (about 15 minutes). Bake the same way you would if you were baking immediately. You can also use a piping bag, or a heavy plastic bag with the corner cut off, to pipe the dough onto the parchment paper. Recipe & images updated Feb 2016. Thanks, Beth! They tasted great too. Hope you give them a try! Oh my, I can’t wait to make these! It’s been so long since I’ve had a cream puff! You’ll love them! 🙂 With the variety of fillings you can do, the options are endless. 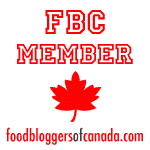 Followed your blog on FB & Pinterest, love your site, Sarah! Oh, they would be! Bake what you need, freeze the rest, and it’s perfect! Happy Anniversary! Another beautiful recipe mastered! I just told another friend about your website, she loves it!! Jeanine, I use Jules GF flour would it work? I’m not sure, since I haven’t ever used Jules GF flour blend. If you do try it, let us know how it works! Jeanine, these look devine! How long do they keep in an airtight container? I’d like to make them ahead of time, just need to know how much time they have!! …also thought you might be pleased to know that a chef (who is not coeliac) said he could not tell the difference between the ones I made and regular gluten filled choux pastry. I made these today as a Christmas treat and they were divine. The dough puffed up beautifully even though I made my cream puffs quite large. This tasted just like the delicious cream puffs I used to eat before I got diagnosed with celiac disease. I used the cream puff filling recipe from the food and wine magazine’s website and put dark chocolate sauce on top. My family could not believe how good they were. I will absolutely be making these again. Correction: I used the chocolate sauce from the Food & Wine website and the filling from the gluten free cream puff recipe on Seriouseats.com. I am sure these would be delicious with any filling and topping however. Again, this was an amazing cream puff recipe. Try it! Thanks Jennie, after a few trial, i finally get a great result. After nearly a decade not eating cream puff, theybtaste so good !!! I decided to whip up these goodies yesterday to accommodate diabetic and gluten-free. I subbed part of the brown rice flour with oat flour and found them to be wet on the inside although they puffed and looked amazing. Would baking them longer be helpful or do I have to use the brown rice flour? I added unsweetened Greek yogurt, mixed berry yogurt and chopped fresh strawberries to slightly sweetened whipped cream. The taste was fabulous. Hi Tilly! It could be the difference – the original recipe calls for white rice and sweet rice, so it could be that the oat flour was a little too heavy. But if they still puffed well, a few more minutes of baking may have helped them too. Did you pierce the cream puffs after baking, and leave them in the oven with the door cracked open? That step should usually help the trapped steam to escape. The filling sounds amazing!! Perfect dessert for those gluten and sugar free! My sister and I used to make a cream puff dessert in a glass cake pan and we loved it – but now miss it terribly. The recipe called for spreading the dough on the bottom of the pan. It would puff up all over, but especially rise on the sides. Then the filling was made and spread over the center part of the baked dough. It was similar to cream puffs, but a fraction of the hassle! Would this gluten free dough behave in the same way? What modifications would you recommend ( I imagine baking time would be affected – but by how much)? Would appreciate any comments! amazing insight. Really enjoyed browsing this blog. Keep up the good work and to everyone keep on tweeting! I haven’t tried it using only brown rice, Jessie. That would require some testing to see if it would work the same way. I think you could sub brown rice for the white, but the sweet rice flour is completely different than those two, so you may have to only buy one? You can get sweet rice flour, also called glutinous rice flour, at Asian stores for cheap. Hope this helps! I’ve heard of others that make flours using the vitamix, but have no experience with that myself. Hi Jill! Brand new recipe for peanut butter pastry cream: http://www.faithfullyglutenfree.com/2016/02/peanut-butter-pastry-cream.html or an older recipe for a vanilla bean pastry cream: http://www.faithfullyglutenfree.com/2008/06/gluten-free-pastry-creamvanilla-pudding.html Both are yummy though! This looks amazing… I miss cream puffs. But I cant have dairy either. Do you think I could sub out the butter with margine? or butter floured Crisco? When you say to stab it with a knife, do I stab it on the top or the side? Wow these look AMAZING Jeanine! Oh my,I miss these so much.Reminds me of my childhood back in Europe when my mom was making these every weekend.I do have a question though,is it possible to leave out the xanthan gum,as my son is allergic to it?I see another recipe from King arthur site where there is no xanthan gum,and their flour blend doesn’t have either. Also,can duck eggs be used and how many?They are quite huge.My son can’t have chicken eggs. Do you think it’d be possible to substitute all purpose gf flour for this? I can’t find sweet rice flour. They are all regular rice flour. Do you have any soloution? Wow – I just finished making eclairs with this batter. Excellent result! I used a star tip to pipe them out. You cannot tell they are gluten free. They rose perfectly! I made these last night for my family, and filled them with whipped cream and elderflower-rhubarb jam. They tasted wonderful but didn’t rise as high as yours. The batter was a bit too runny to mound up properly, even though I cooked the flour mixture till it was playdough consistency. I’ll try them again with a touch less liquid. Great recipe, though. Thanks! Cream puffs can be so finicky. If the eggs are a little too large, that can throw it off too. Definitely give them a try again, they are really good! I’m over the moon with how these turned out! I didn’t that’s any sweet rice flour so I used Bob’s Red Mill 1:1 baking flour since the first ingredient was sweet rice flour. I did omit the xantham gym. They taste just like my grandma used to make. Thank you so much for the recipe.